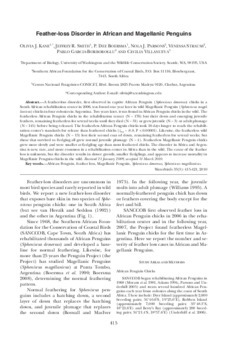 A feather-loss disorder, ﬁrst observed in captive African Penguin (Spheniscus demersus) chicks in a South African rehabilitation center in 2006, was found one year later in wild Magellanic Penguin (Spheniscus magellanicus) chicks in four colonies in Argentina. Two years later, it was found in African Penguin chicks in the wild. The featherless African Penguin chicks in the rehabilitation center (N = 176) lost their down and emerging juvenile feathers, remaining featherless for several weeks until they died (N = 31) or grew juvenile (N = 3) or adult plumage (N = 145) before being released. The featherless African Penguin chicks took 16 days longer to reach the rehabilitation center’s standards for release than feathered chicks (t176 = -8.8, P < 0.00001). Likewise, the featherless wild Magellanic Penguin chicks (N = 13) lost their second coat of down, remaining featherless for several weeks; but those that survived to ﬂedging all grew normal juvenile plumage (N = 4). Featherless Magellanic Penguin chicks grew more slowly and were smaller at ﬂedgling age than most feathered chicks. The disorder in Africa and Argentina is new, rare, and more common in a rehabilitation center in Africa than in the wild. The cause of the feather loss is unknown, but the disorder results in slower growth, smaller ﬂedglings, and appears to increase mortality in Magellanic Penguin chicks in the wild.